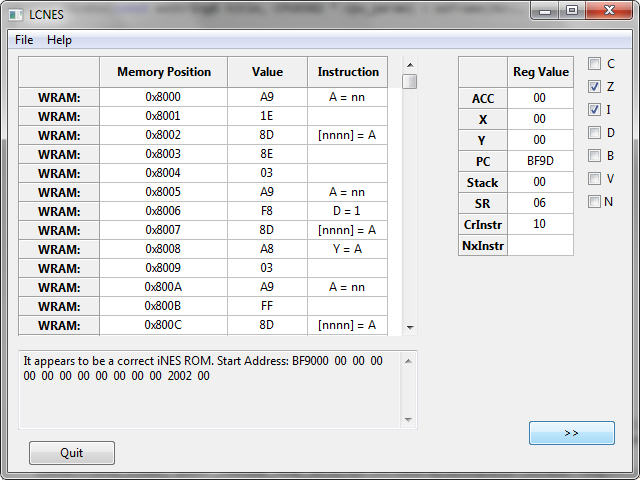 LCNES is a very simple debugger for the 6502 8-bit microprocessor, released in 1975. It was used in Nintendo´s first home console, the NES. The debugger was in fact programmed with the NES specs in mind. I started this project in late 2008, starting third year of my engineering degree. Because we had only been introduced to the Java programming language, I thought I was missing out on the power of compiled languages, and chose C/C++ because lots of learning materials were available. I also wanted to find out an easy way to make portable GUIs, and loved emulators. The project lasted for a year, and I ended up learning about the marvelous wxWidgets libraries, and the dark world of emulator programming. The source code and VS2010 project can be found here. To compile properly you need to install the wxWidgets libraries. There is a link above that explains how. Bear in mind it was a learning exercise! The source code is sloppy and full of silly mistakes. The executable file can be found here. Unfortunately I cannot provide a ROM for testing.